Jasmine joined our Superdog Daycare team in 2008. She is a very calming, generous addition to our team. Her assertive leadership with fellow staff members and the dogs are a very strong asset. Currently Sarah Beattie's bio is not available. Please come back soon to view her bio. Tracy has been with Superdog Spectrum since 1999 and has been managing our Dog Daycare since early 2009. Her knowledge and dedication make her a very valuable leader for our team of caregivers. 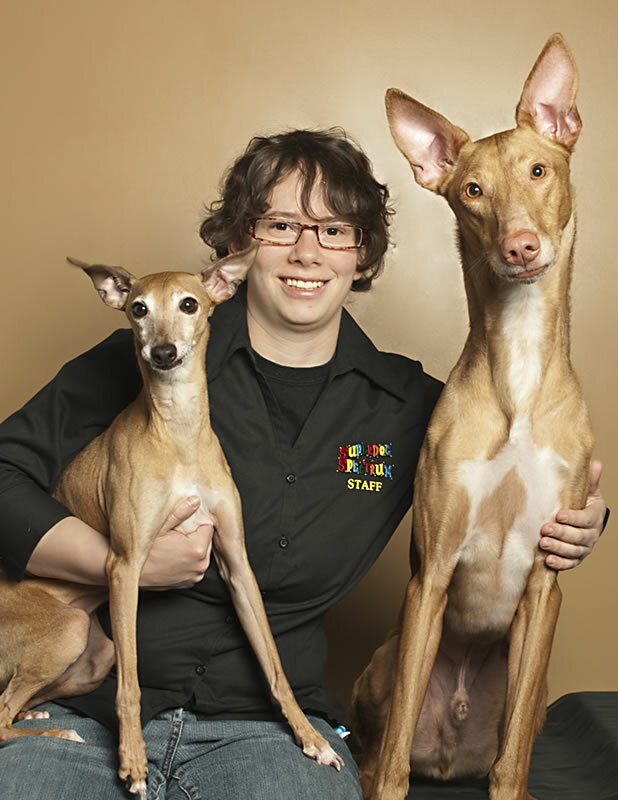 Tracy is a Superdog Team Member along with her 4 dogs Smudge (Lab x), Winter (Border Collie), Beaker (Italian Greyhound), and Kizmit (Pharaoh Hound). She competes in Agility having earned a Special Advanced Agility Dog of Canada Title with Smudge along with numerous other titles. Tracy has also begun competing in Lure-Coursing with Kizmit and finds it very exciting not to mention rewarding! Tracy has rescued three of her dogs, and has provided them with a loving, active and understanding home. She loves working with dogs as "it is a new adventure everyday". Tracy's expansive experience rehabilitating dogs with social anxieties has proven to be an exceptional asset to our Daycare and training team. We are proud to have her on board! Lynn has worked in our daycare since 2007. She is a very capable dog walker and a very valuable part of our Superdog daycare team. She plays an intricate part in the daily functioning of our facility. She makes an effort everyday to learn more about the canine mind, and having the knowledge of our staff is a valuable resource to her. Lynn loves all creatures great and small. She has a cat named “Stinky” she rescued as a stray. Her compassion, desire and kindness are a great inspiration to all who have the pleasure of knowing and working with her. We would be lost without the cheerful and positive attitude she brings to the Superdog Spectrum everyday. Hey there, I'm Alex McNeil. I have loved dogs from the start and can’t think of a better way to show my love for the species then to learn everything I can learn about them. Then I found it. In the form of love... and bacon.